Traffic channel can sustain upto 10% of BLER in low SINR but control channels cannot. Neighbor interference can result in radio link failures at cell edge. One scheme of ICIC is where neighbor eNBs use different sets of resource blocks through out the cell at given time i.e. no two neighbor eNBs will use same resource assignments for their UEs. This greatly improves cell-edge SINR. The disadvantage is decrease in throughput throughout the cell, since full resources blocks are not being utilized. may below is also useful to us,.. While I accept the principle and necessity to implement the ICIC scheme outlined above, I question the practicality. To implement ICIC means all the neighboring eNBs are time-synchronized, at least to half of the normal cyclic prefix duration of (about 2.4 micro-seconds). CDMA mandates the use of GPS timing receiver to coordinate the PN offset assignment, but since 3G WCDMA, the use of GPS time coordination has been eliminated. I do not think the LTE cells are time-coordinated. 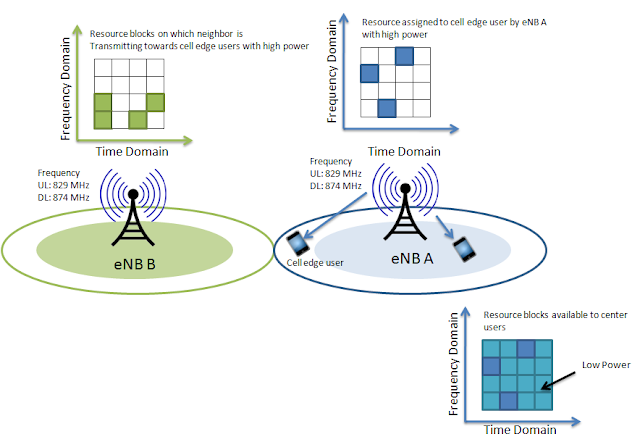 I doubt the x2 interface linking neighboring cells can achieve the time synchronization up to micro-seconds, considering all those embedded SW/HW and even signal propagation delays. I could be wrong. Someone please enlighten me. Thanks. I don't think eNBs needs to time synchronized in the case of FDD systems. Increase in the noise level dues no synchronization is not high. If my understanding is correct, eICIC consists of basetsations coordinating their transmissions in the time domain to reduce interference and consequent degradation of throughout, particularly at the edges of the cells so you would expect that timing would be critical. Unfortunately, there is no agreement in 3GPP what level of sync accuracy is required. I wonder if anyone has a view on this on any test data that confirms the impact of timing on throughput. Hi Adnan, your blog is a very useful reference for me. I'd like to use one of your diagrams in an upcoming market research report....could you please reply to let me know if this is ok? Not really sure. Could you refer the source link? Hello, my name is Milena and I'm student of Universidad Del Cauca in Popayán, Colombia. I whish find a sofware allow me to simulate a HetNet link to system level in different scenarios, varying of femtocell densyti. My e-mail is: milemile12009@hotmail.com and accept suggestions. Yes it is true eNBs has to be critically time sync in order to support eICIC. May be X2 interface has to have optical fibre as the layer-2. Hello all, thanks for this blog ! If macro cell configure ABS subframes then UEs connected to pico/femto cells can send their data during such ABS frames and avoid interference from macro cell. 1. What about the UE2 which is connected to MACRO cell? it should be also impacted by the ABS generation. 2. Is UE2 configured with the right measurement ABS for the patterns (eg. csi-MeasSubframeSet) ? 3. Is UE2 impacted by creating of CRE (in idle and connected states)? 4. Is UE2 sends CQI at two different offsets as configured by RRC? Could you please explain the difference between OTDOA blanking and eICIC. OTDOA is a location based feature where eICIC is predominantly cell edge interference mitigation. I believe the use of C-RAN BBU pools will assist with the sync issue as well. X2 and BBU's will live in the cloud so latancy should be extremely low. The question is how would this be addressed with adjacent BBU pools? Current standards only allow for a BBU pool to be about 10 to 15 miles away from the RRU. How much latency is there between two BBU pools? I believe this would require careful planning for BBU pools at cell edge areas where macro and small cells are in adjacent BBU pools. Hi everyone , What is inter-cell interference ? Can you tell me about this?